Since the start of this year’s road season I had hoped to make it down to West Virginia for the legendary Tour of Tucker County road race. Two large climbs, with the final stretch into the finish reaching 20% in places and lasting over 25 minutes for most racers, competitive fields, impressive event organization; sounded like a destination race to cap the season. In planning the trip to WV I was informed of a second race, the day before, and only an hour and a half drive away. The Mountain Masacree road race starts in the awesomely named, Friendsville, MD, and finishes on the even better Friendsville-Accident Rd. 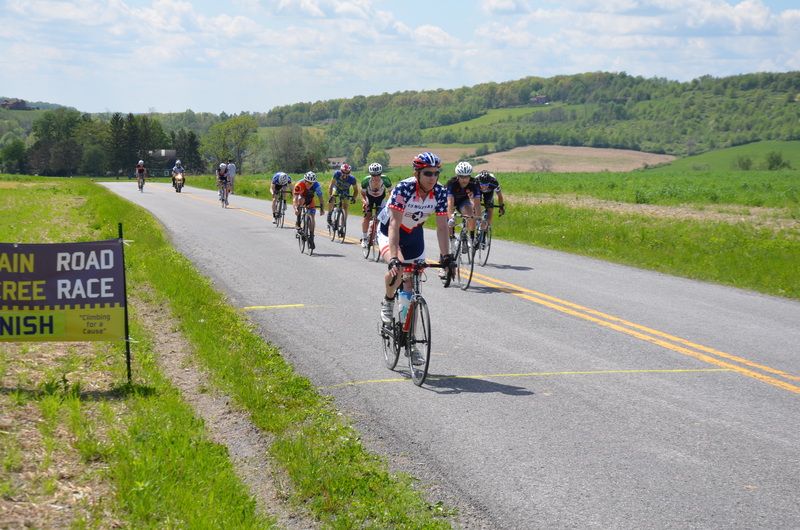 Even hillier than Tucker County and reported to be one of the best races in the region, it merited serious consideration for a tough race weekend. Once team mate Brandon Shaw & I took a few moments to google that Maryland is, in fact, only a four and a half hour drive from Columbus, the plans were set. Two PG racers would travel to MD and WV, and race two of the most legendary races in our region in the same weekend, and return home likely very tried, but 15,000ft richer in elevation gain. Brandon and I departed Columbus early the morning of the race and made easy work of the drive, arriving in Friendsville two hours before the race start. The drive was passed quickly with endless comparisons of the highway length and grade to those reported to be on the course. Comparisons aside the most sobering moment is the drop into the valley that contains Friendsville. Steep hillsides jut up from the town’s borders at every side, topping out hundreds of feet above the valley floor. The race starts way down there. The only way to go is up. Gulp. As we prepared for the race I noted that this was the most “bike racer” race I had ever seen. There was not one preparing rider who was not slim and strong looking. Every participant looked like a threat and a strong athlete. As Ohio racers, with Lake Hope being out hilliest race, the intimidation was a factor, I had no idea how we would compare against riders who had the opportunity to train on real climbs every week. Our nerves were calmed slightly by a greeting by the mayor of Friendsville. He was excited we had traveled to his town from Ohio, and hoped we had a good race. I’m not sure he understood the possibility for mental and physical trauma caused by his town’s topography. The race began in normal road race fashion with a neutral roll out of town. We passed the “Mile 0” sign and the race began. For our category three race, the Mountain Massacree course followed three laps of a loop, with a final bonus climb into the finish. Each lap includes two large climbs, Sam Friend Rd Climb, and Pig’s Ear Climb. The race totals 57.6 miles and over 7,700ft of vertical. The race continued on a gradual climb, before making a tight left turn onto Sam Friend Rd. This is approximately the moment when everyone in the race, outside of one or two either very confident or very dumb racers, realize they’re in trouble. The first climb took our group eight minutes to complete. I spent six of these eight minutes just trying to hang onto the lead pack. Every turn in the road would reveal a steeper pitch and more climb to come. Finally the climb tops out and you are rewarded by a series of, what I would define as rollers after this climb, but would normally be the deciding factor in any Ohio race. The race then makes another left onto an exposed farm road that pitches up, before curving into tree cover concealing another difficult climb. The Pig’s Ear climb takes less than five minutes, but is steeper and decidedly more soul crushing than the previous large climb. Thankfully, after this ascent you are treated to a descent with tight corners an a 50mph+ straightaway leading back into town for your next lap. The race would split apart in many sections along the course, loosing a rider or two every time. 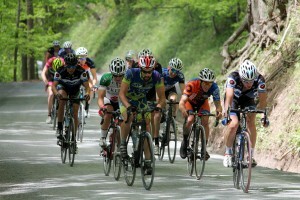 Both the climbs and descents would shell riders from the group. Going into the second time up Sam Friend Rd I was ready, I felt great on the climb, held my spot in the pack easily, and was able to put in some work after the top. Pig’s Ear went by quickly, but upon the crest I could feel the beginnings of the burn. With the knowledge of the previous lap I defended into town more quickly, topping out just under 52mph. On the approach into town a rider in front of me grabbed an unreasonable amount of brake and tried to move into a gap that was not there. His rear derailleur gouged into my front wheel, sending aluminum shavings into the air. I was able to stay upright, but my front wheel now wobbled back and forth and I worried about a compromised spoke. I didn’t see the rider again after this incident; I suspect his RD may have been damaged from the contact. The final Limestone climb into the finish. We began the final lap onto the course and I took advantage of the neutral feed for a fresh bottle. This time the climbs hurt, a lot. Riders would push the pace, attacking at every turn to challenge the pack. At the peak of the climbs the group would re-form, no one eager to work in the wind in a race that would likely be decided on the final climb. On the final twisting descent into town a rider in front of me took too wide of a line through a sweeping corner, barely avoiding a car in the other lane by ditching himself and his bike into the shoulder. I passed just in time to see him preform a deft summersault and pop up, ready to remount his bike. To my surprise he rejoined the group 3-4 miles later, without injury. In the final pass through the feed zone I ditched my two bottles in preparation for the final bonus climb. My legs felt good, but certainly weren’t where they were at at the start of the race. Approaching the final climb another rider crashed in what I would guess was an unfortunate line choice mishap. The falling rider took another with him who fell into me, but I leaned into the force and resisted without issue. Our group exchanged exclamations on the “bonkedness” of many riders in the group, causing some sloppy and inattentive riding. The final climb begins with a right turn onto a narrow bridge. Shortly after the bridge the pavement turns into a high quality dirt road. With only four miles left in the race the pace began to climb. Initially I couldn’t respond, but as the hill continued I began to move up. I completed the hill at the front of my group, but I had failed to notice a rider who had broken away a few minutes previous. Not knowing the course, I was surprised to find the final climb concluded by a brief descent, a more moderate climb, and a gentile approach into the finish. I was stuck on the front of the group for the last mile of the race, and as we neared the line I felt that an attempt to move back may hamper my ability to respond to any attacks. I led the group into the final kilometer, knowing I was in the wrong place for the finish. With 500m to go a rider passed to my left and I attempted to respond. I got within a foot or two of their wheel but had no snap left in my legs. I pushed towards the line, hoping to hold off as many riders as I could. In the final 100m I was caught by the remaining group, and I was able to hold on to fifth in this finishing pack. It wasn’t until I learned of the rider off the front that I realized I had finished sixth, just out of the money. At the finish I drank three bottles of water a waited for Brandon to finish. After we met up we began the ten miles back to the car. These were the hardest ten miles I have ever completed, and at one point I had to eat my “emergency” gel to stave off a bonk that threatened my return home. I am very happy with my 6th place finish. I feel that with better tactics and knowledge of the course I could have improved my placing by a few spots. I will return next year with hopes of improvement.